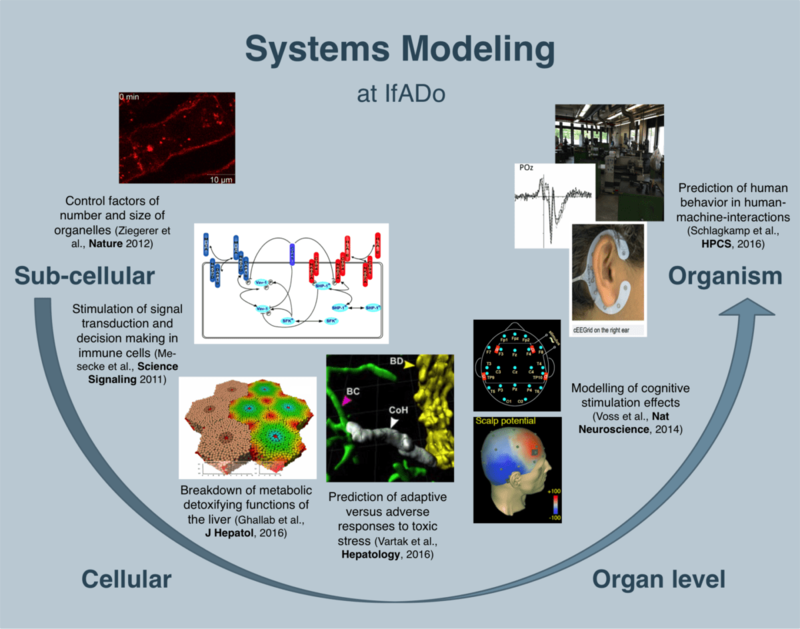 In recent years IfADo has established Systems Modeling to understand the complex, time-resolved interplay among numerous components which finally determine human factors relevant for working environments, namely cognition, behavior, emotion, motivation, and also those that determine the dynamics and kinetics of toxins and drugs and finally influence the labile balance of health and disease. This includes bridging the scales from subcellular to cellular, to the organ level all the way up to prediction of human behavior in human machine interaction (Fig. 1). Here, mathematical Systems Modeling helps to clarify the underlying principles. In our recent work, Systems Modeling has been instrumental to elucidate mechanisms and principles that were not accessible by traditional approaches. Moreover, Systems Modeling guides experimentation by choosing the most informative experiment (or data acquisition) resulting in reduction of experiments and financial resources. Examples at the cellular and molecular level are modeling of control factors of number and size of endosomes at the subcellular level (Zeigerer et al., Nature, 2012); simulations of signaling networks that tip the balance from tolerant to active states of immune cells (Mesecke et al., Science Signaling, 2011); prediction of chemical exposure scenarios, when metabolic detoxifying functions of the liver can no longer be maintained and lead to a functional break down (Ghallab et al., J. Hepatol., 2016); simulations, whether architectural changes of tissues after exposure to workplace chemicals represent adaptive or adverse responses (Vartak et al., Hepatology, 2016; Jansen et al., 2017). At the organ and organism level modeling of and obtaining data about physiological effects of non-invasive brain stimulation on functional connectivity via MRI (Polania et al., Neuroimage 2011, Polania et al. Curr Biology 2012), modeling of physical stimulation effects to target cognitive stimulation (Voss et al., Nature Neurosci., 2014) and prediction of human behavior in machine interaction (Schlagkamp et al., HPCS, 2016) have been important components of our scientific work. In past years, Systems Modeling had been performed within cooperations and research networks mainly with external partners hence it represents an expertise that is not sufficiently established at IfADo. However, currently more than 5 million Euros of external research grants (BMBF, EU, DFG) are active at IfADo pertaining to our work in the field of Systems Modeling. While these collaborations were successful in the past, it is becoming increasingly clear that the absence of the necessary expertise and infrastructure at IfADo is hampering the future success of our Systems Modeling approaches. In future, it would represent an enormous progress if the Systems Modeling expertise could be established at our institute to reduce dependency on external partners and to take advantage of the synergy potential between modeling and experimentation by directly bringing modelers and experimental partners together at IfADo. Additional advantages can be gained by applying similar modeling methods and concepts to the different possible applications at IfADo, and to prospectively integrate the IfADo expertise on liver, immune system and brain into models studying their interplay. Here you find more information on future perspective – modeling the brain-liver-immune axis. Bakken TE, Roddey JC, Djurovic S, …, Hill M, Gruen J, Bosson-Heenan J, Carlson H (2012) Association of common genetic variants in GPCPD1 with scaling of visual cortical surface area in humans. Proc Natl Acad Sci USA Mar 6;109(10):3985-90. Cadenas C, Franckenstein D, Schmidt M, Gehrmann M, Hermes M, Geppert B, Schormann W, Maccoux LJ, Schug M, Schumann A, Wilhelm C, Freis E, Ickstadt K, Rahnenführer J, Baumbach JI, Sickmann A, Hengstler JG (2010) Role of thioredoxin reductase 1 and thioredoxin interacting protein in prognosis of breast cancer. Breast Cancer Res 12(3):R44. doi: 10.1186/bcr2599. Claus M, Dychus N, Ebel M, Damaschke J, Maydych V, Wolf OT, Kleinsorge T, & Watzl C (2016) Measuring the immune system: a comprehensive approach for the analysis of immune functions in humans. Archives of Toxicology 1-15. Doi: 10.1007/s00204-016-1809-5. Drasdo D, Hoehme S, Hengstler JG (2014) How predictive quantitative modelling of tissue organisation can inform liver disease pathogenesis. Journal of Hepatology 61:951-956. Falkenstein M, Hohnsbein J, Hoormann J (1991) Effects of crossmodal divided attention on late ERP components. II. Error processing in choice reaction tasks. Electroencephalogr. Clin Neurophysiol 78:447-455. Fresnoza S, Paulus W, Nitsche MA, Kuo M-F (2014a) Non-linear dose-dependent impact of D1 receptor activation on motor cortex plasticity in humans. J Neurosci 34:2744-2753. Fresnoza S, Stiksrud E, Klinker F, Liebetanz D, Paulus W, Kuo MF, Nitsche MA (2014b) Dosage-dependent effect of dopamine receptor activation on motor cortex plasticity in humans. J Neurosci 34:10701-10709. Frey O, Misun PM, Fluri DA, Hengstler JG, Hierlemann A (2014) Reconfigurable microfluidic hanging drop network for multi-tissue interaction and analysis. Nat Commun 30;5:4250. Gajewski PD, Hengstler JG, Golka K, Falkenstein M, Beste C (2013) The functional tumor necrosis factor-alpha (308A/G) polymorphism modulates attentional selection in elderly individuals. Neurobiol Aging 34: 2694.e1-2694.e12. Gajewski PD, Falkenstein M, Hengstler JG, Golka K (2016) Reduced ERPs and theta oscillations underlie working memory deficits in Toxoplasma gondii infected seniors. Biol Psychol 120: 35-45. Garrecht, R, Meyer, R, Duppach, J, Reipschlager S., Watzl C, and Niemeyer, CM (2016) Designed DNA Surfaces for in Vitro Modulation of Natural Killer Cells. Chembiochem 17: 486-492. Getzmann S, Gajewski PD, Hengstler JG, Falkenstein M, Beste C (2013) BDNF Val66Met polymorphism and goal-directed behavior in healthy elderly – evidence from auditory distraction. Neuroimage 64: 290-298. Ghallab A, Cellière G, Henkel SG, Driesch D, Hoehme S, Hofmann U, Zellmer S, Godoy P, Sachinidis A, Blaszkewicz M, Reif R, Marchan R, Kuepfer L, Häussinger D, Drasdo D, Gebhardt R, Hengstler JG (2016) Model-guided identification of a therapeutic strategy to reduce hyperammonemia in liver diseases. J Hepatol 64(4):860-71. Godoy P, Hewitt NJ, Albrecht U, Andersen ME, Ansari N, Bhattacharya S, et al (2013) Recent advances in 2D and 3D in vitro systems using primary hepatocytes, alternative hepatocyte sources and non-parenchymal liver cells and their use in investigating mechanisms of hepatotoxicity, cell signaling and ADME. Arch Toxicol 87:1315-1530. Hewitt NJ, Lechón MJ, Houston JB, Hallifax D, Brown HS, Maurel P, Kenna JG, Gustavsson L, Lohmann C, Skonberg C, Guillouzo A, Tuschl G, Li AP, LeCluyse E, Groothuis GM, Hengstler JG (2007) Primary hepatocytes: current understanding of the regulation of metabolic enzymes and transporter proteins, and pharmaceutical practice for the use of hepatocytes in metabolism, enzyme induction, transporter, clearance, and hepatotoxicity studies. Drug Metab Rev 39(1):159-234. [mehr als 400 Zitationen in (-kursiv) ISI Web of Science, 11/2016]. Hoehme S, Brulport M, Bauer A, Bedawy E, Schormann W, Hermes M, Puppe V, Gebhardt R, Zellmer S, Schwarz M, Bockamp E, Timmel T, Hengstler JG, Drasdo D (2010) Prediction and validation of cell alignment along microvessels as order principle to restore tissue architecture in liver regeneration. PNAS 107(23):10371-6. Hoffmann S, Labrenz F, Themann M, Wascher E, Beste C (2014) Crosslinking EEG time-frequency decomposition and fMRI in error monitoring. Brain Struct Funct 219:595-605. Kiemeney LA, Sulem P, Besenbacher S, … Hengstler JG, Blaszkewicz M, … Knowles MA, Rafnar T, Stefansson K (2010) A sequence variant at 4p16.3 confers susceptibility to urinary bladder cancer. Nat Genet 42(5):415-9. Krug AK, Kolde R, Gaspar JA, Rempel E, Balmer NV, Meganathan K, Vojnits K, Baquié M, Waldmann T, Ensenat-Waser R, Jagtap S, Evans RM, Julien S, Peterson H, Zagoura D, Kadereit S, Gerhard D, Sotiriadou I, Heke M, Natarajan K, Henry M, Winkler J, Marchan R, Stoppini L, Bosgra S, Westerhout J, Verwei M, Vilo J, Kortenkamp A, Hescheler J, Hothorn L, Bremer S, van Thriel C, Krause KH, Hengstler JG, Rahnenführer J, Leist M, Sachinidis A (2013) Human embryonic stem cell-derived test systems for developmental neurotoxicity: a transcriptomics approach. Arch Toxicol 87(1):123-43. Küper K, Rivkin W & Schmidt, KH (2016 im Druck). Training Interventions to increase innovation and productivity in age-diverse teams. In C. Schlick (Hrsg. ), Advances in Ergonomic Design of Systems, Products and Processes. Springer. Kuo MF, Paulus W, Nitsche MA (2008) Boosting focally-induced brain plasticity by dopamine. Cerebral Cortex 18:648-651. Mesecke S, Urlaub D, Busch H, Eils R and Watzl C (2011) Integration of activating and inhibitory receptor signaling by regulated phosphorylation of Vav1 in immune cells. Sci Signal 4, ra36. Monte-Silva K, Kuo M-F, Thirugnanasambandam N, Liebetanz D, Paulus W, Nitsche MA (2009) Dose-dependent inverted U-shaped effect of dopamine (D2-like) receptor activation on focal and non-focal plasticity in humans. J Neurosci 29:6124-6132. Polanía R, Nitsche MA, Korman C, Batsikadze G, Paaulus W (2012) The importance of timing in segregated theta phase-coupling for cognitive performance. Curr Biol 22(14):1314-18. Rivkin W, Diestel S & Schmidt KH (2015) Affective commitment as a moderator of the adverse relationships between day-specific self-control demands and psychological well-being. J Vocat Behav 88:185-194. Rothman N, Garcia-Closas M, Chatterjee N, …, Selinski S, Hengstler JG, …, Fraumeni JF Jr, Silverman DT, Chanock SJ (2010) A multi-stage genome-wide association study of bladder cancer identifies multiple susceptibility loci. Nat Genet 42(11):978-84. Sänger J, Bechtold L, Schoofs D, Blaszkewicz M & Wascher E (2014) The influence of acute stress on attention mechanisms and its electrophysiological correlates. Frontiers in Behavioral Neuroscience 8:353. Seer C, Lange F, Georgiev D, Jahanshahi M, Kopp B (2016) Event-related potentials and cognition in Parkinson’s disease: An integrative review. Neuroscience & Biobehavioral Reviews 71: 691-714. Schliess F, Hoehme S, Henkel SG, Ghallab A, Driesch D, Böttger J, Guthke R, Pfaff M, Hengstler JG, Gebhardt R, Häussinger D, Drasdo D, Zellmer S (2014) Integrated metabolic spatial-temporal model for the prediction of ammonia detoxification during liver damage and regeneration. Hepatology 60(6):2040-51. Schmidt KH & Neubach B (2007) Selbstkontrollanforderungen: Eine vernachlässigte spezifische Belastungsquelle bei der Arbeit. Zentralblatt für Arbeitsmedizin 57:342-348. Schmidt KH, Beck RE, Rivkin W & Diestel S (2016) Self-control demands at work and psychological strain: the moderating role of physical fitness. Int J Stress Managem 23:255-275. Selinski S, Getzmann S, Gajewski PD, Blaszkewicz M, Hengstler JG, Falkenstein M, Golka K (2015) The ultra-slow NAT2*6A haplotype is associated with reduced higher cognitive functions in an elderly study group. Arch Toxicol 89:2291-2303. Stewart JD, Marchan R, Lesjak MS, Lambert J, Hergenröder R, Ellis JK, Keun H, Schmitz G, Schiller J, Eibisch M, Hedberg C, Waldmann H, Lausch E, Tanner B, Sehouli J, Sagemüller J, Staude H, Steiner E, Hengstler JG (2012) Choline-releasing glycerophosphodiesterase EDI3 drives tumor cell migration and metastasis. PNAS 109(21):8155-8160. Uhlén M, Fagerberg L, Hallström BM, … Edlund K, … Pontén F (2015) Proteomics. Tissue-based map of the human proteome. Science 347(6220):1260419. Vartak N, Schmick M, Papke B, Kovacevic M, Truxius DC, Rossmannek L, et al (2014) KRas Localizes to the Plasma Membrane by Spatial Cycles of Solubilization, Trapping and Vesicular Transport. Cell 157:459–471. Vartak N, Damle-Vartak A, Richter B, Dirsch O, Dahmen U, Hammad S, et al (2015) Cholestasis-induced adaptive remodeling of interlobular bile ducts. Hepatology 63(3):951-64; doi:10.1002/hep.28373. Vartak N, Damle-Vartak A, Richter B, Dirsch O, Dahmen U, Hammad S, Hengstler JG (2016) Cholestasis-induced adaptive remodeling of interlobular bile ducts. Hepatology 63(3):951-64. Voss U, Holzmann R, Hobson A, Paulus W, Koppehele-Gossel J, Klimke A, Nitsche MA (2014) Induction of self awareness in dreams through frontal low current stimulation of gamma activity. Nat Neurosci 17:810-812. Watzl C, Sternberg-Simon M, Urlaub D Mehr, R (2012) Understanding natural killer cell regulation by mathematical approaches. Front Immunol 3, 359. Watzl C (2014) How to trigger a killer: modulation of natural killer cell reactivity on many levels. Adv Immunol 124:137-170. Zeigerer A, Gilleron J, Bogorad RL, Marsico G, Nonaka H, Seifert S, Epstein-Barash H, Kuchimanchi S, Peng CG, Ruda VM, Del Conte-Zerial P, Hengstler JG, Kalaidzidis Y, Koteliansky V, Zerial M (2012) Rab5 is necessary for the biogenesis of the endolysosomal system in vivo. Nature 485(7399):465-70. Zellmer S, Schmidt-Heck W, Godoy P, Weng H, Meyer C, Lehmann T, Sparna T, Schormann W, Hammad S, Kreutz C, Timmer J, von Weizsäcker F, Thürmann PA, Merfort I, Guthke R, Dooley S, Hengstler JG, Gebhardt R (2010) Transcription factors ETF, E2F, and SP-1 are involved in cytokine-independent proliferation of murine hepatocytes. Hepatology 52(6):2127-36.